Welcome to THE VETTE NET, the first online Corvette business, a place where enthusiasts come to meet when selling their prized cars, a place where we connect them with the best match and arrange a smooth and mutually profitable transaction. Our company is also a proud Lifetime Business Member of the National Corvette Museum. It is impossible to overstate the significance of the 1963 model in the Corvette line-up… The Split Window Coupe is a unique model, an instant darling for collectors and enthusiasts. Our offer today is a fine example of this special vintage, a Silver Coupe with the Red interior, which is in excellent condition due to a thorough on-frame restoration done eight years ago. The exquisite paintjob is the correct Sebring Silver, is done right and still looks pretty much like new. Has front clear bra protecting from road debris. Chrome parts were re-done and are in exquisite condition. Engine is the optional 327/300 matching numbers all around: casting, VIN, suffix with all correct cosmetic appearance: dual snorkel air cleaner, correct shielding. Engine was recently rebuilt, bored .0030 over with only 600 miles on it since and documented to put out 295 HP. Transmission is a period correct Muncie M20 which was used to replace the T10. The original transmission is a factory T-10 which GM then replaced later in 1963 with the Muncie (the original which will be included with the purchase, needs repair). Carburetor is original, still with the “Green Tag”, also original expansion tank is present. Power options include factory power brakes and power windows. Undercarriage is original and very clean with new rubber parts done in 2010 as seen in the pics. Rear end was upgraded to a new 3.70 and original is available. When restored, the original leaf spring was replaced with Monospring. Exhaust looks new, brakes work great… Original wheels are available (need refurbishing), but now car is endowed with 65-style Knock-off Kelsey Hayes reproduction wheels with spinners and red-line tires. Original distributor was replaced with electronic Pertronix tach drive modern version. Alternator and radiator were rebuilt, hoses are correct, and a thermostat-controlled electric fan (bolt on) helps with cooling on hot Arizona days. Car rides and drives like new… Everything is in working order, all is needed is another good home. 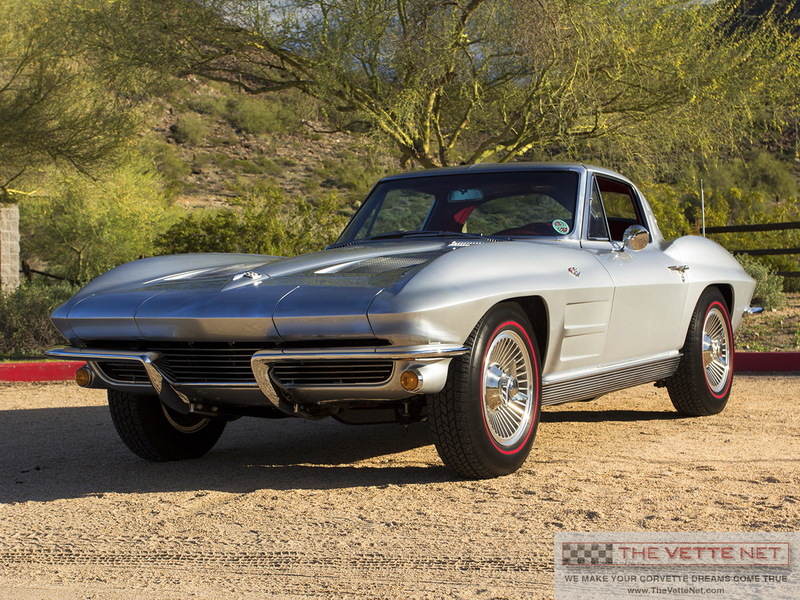 A great addition to your collection, a true milestone Corvette, the Split Window Coupe will always be THE one to have and cherish. Located in ARIZONA, we can assist with delivery nationwide and all over the world. Corvette trades are considered, also financing is provided by our partners at JJ Best Bank Co. (click here to apply).